Thanks to the digital age, price transparency has vastly improved for many goods and services including homes, cars, consumer electronics, airline flights, etc. 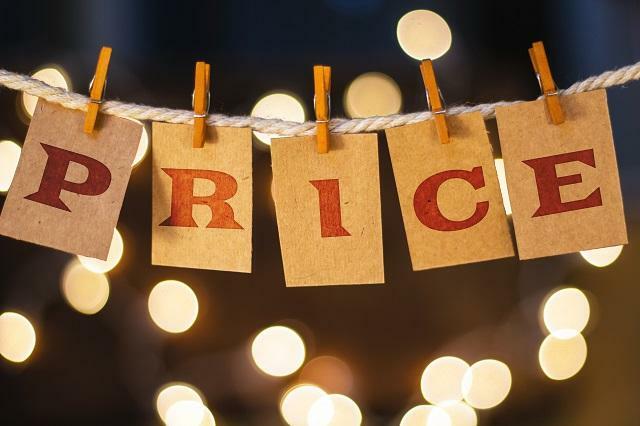 With greater awareness of pricing comes improved confidence and trust for consumers for the goods and services they buy. In fact, more consumers are demanding transparency and are willing to pay a premium for it. In a recent study of 2,000 consumers, nearly 75% of those surveyed would pay MORE for products that offer complete transparency. While some industries still seem stuck in the dark ages with price transparency, healthcare being the obvious offender, a growing number of industries are learning that transparency puts consumers at ease and is an essential part of building trust with their clients. While the financial services industry continues to make strides with better pricing transparency and disclosures, it still has a lot of work to do. A recent Harris poll revealed that 61% of those surveyed said that they did not know all of the fees they paid in all of their investment accounts. That number is staggering considering how sensitive people are about paying unnecessary fees. The problem? The fees often-associated with financial products are complex, confusing, or downright hidden. Consumers continue to fight to have more information about the food we consume, knowledge of potentially toxic ingredients in everyday household products and the cars we drive, and awareness of any other potentially harmful effects (bodily or otherwise) from the products and services we use. However, the investors are still largely in the dark when it comes to fees associated with their investment accounts. As an industry based on relationship and trust, it is an outdated and flawed operating system to continue keeping investment and management fees mysterious to investors. Most financial advisors will communicate what they charge up-front. It can be 1% or more or sometimes even less. However, this is only part of the expense picture. There are the additional fees, including investment expense ratios that are embedded in the investments themselves. Therefore, it’s important to understand your all-in fees. The all-in-fees can range depending on the type of advisor, broker and investment product used. These fees can range from as low as 1% to over 3%. 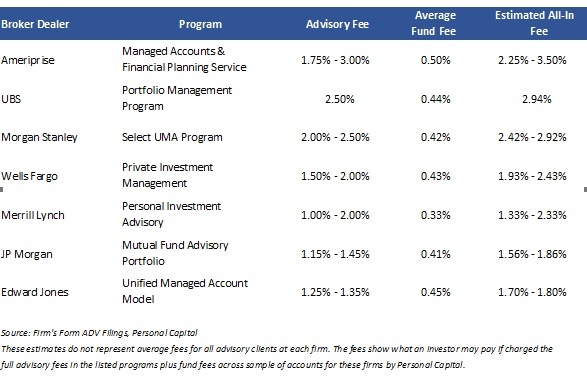 The table below highlights the median all-in-fees by portfolio size. For example, an investment portfolio up to $250,000 managed by an advisor pays an average advisory fee of 1% and an investment product fee of 0.85%, which combine for an all-in-fee of 1.85%. Expenses for underlying investments used by advisors can also vary widely. As the chart below shows, expense ratios can range from the very low end of 0.20% to a high of greater than 1%. 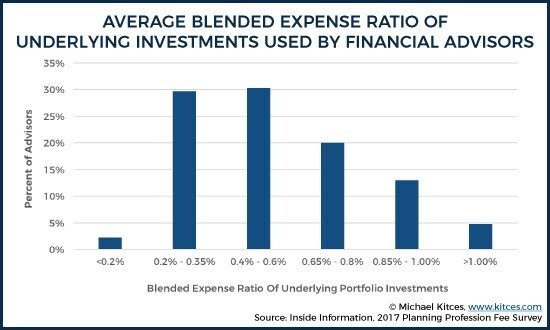 Surprisingly, despite the greater use of low-cost mutual funds and ETFs, less than 5% of advisors surveyed had a blended expense ratio of less than 0.20%. It’s important to note that this survey was conducted with 1,000 financial advisors. Since the major brokerage firms (UBS, Merrill Lynch, Morgan Stanley etc.) still have the majority of market share of investment assets, I’ve included a table that highlights the fee ranges for the largest broker-dealers. As you can see, the all-in-fee ranges can vary widely with some approaching and even topping 3%. All investors, whether those that work with advisors or do-it-yourself investors, should always be informed about what they are pay in investment fees and why. 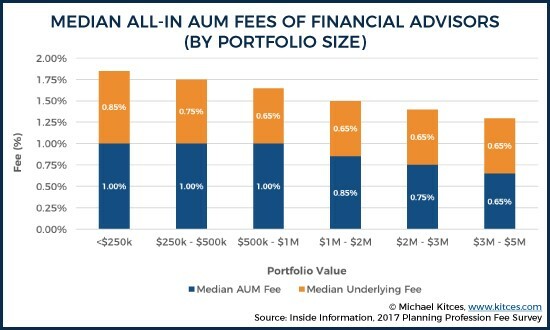 For investors working with advisors, a clear understanding about fees, especially those fees that affect investment performance and reaching retirement goals, are vital. Fee levels should be evaluated with additional value-producing advisory services offered including but not limited to investment goal setting and asset allocation, rebalancing, education savings, tax optimization, and investing counseling. What are you paying? What services are you getting? And what is the long-term outlook of your wealth building potential? The last thing any investor should worry about is losing out on potential returns because they chose to invest in a high-cost product or provider. As you consider hiring a financial adviser or switching from your current one, be sure you are asking these questions so you select the right option for you.